Wow, that’s a great idea, with a crown-of-thorns suction cup to attach Jesus to the tiles next to the sink. I’m very inetersted to know who Moses will support – Jesus or Md. He’s quite prominant in both religions-known as Musa in Islam. This one doesn’t count though. wait… tacky figurines of jesus? hasn’t someone already thought of that? 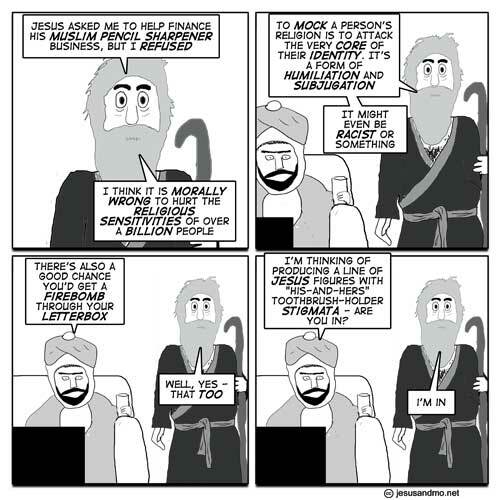 I reckon Moses shifts dodgy laptops and stuff down at the pub; maybe that’s how he has the readies to finance Jesus. Mind you, if he financed Mo, would it have to be an interest free loan? Usury and all that? Excellent! I wonder, can Mo work in a bobblehead to the design? Please write one about the Atheist Bus Slogans (http://www.justgiving.com/atheistbus). I know it would be brilliant! Press return after each line, and put a blank line between each panel (no need to put who’s speaking). That’s it! Thanks again. Press return after each line of dialogue, and leave a blank line after each panel. Format dialogue like Character’s name: What are the haps? You don’t have to add “PANEL 1:” labels. So should I or should I not include the character names? I’ve decided to follow the above-form instructions for now, but I’d like to know for future reference. Making fun of islam’s double-standard and penchant for violence never gets old… Rock on, author, and stand back when you open your mailbox. Timothy, thanks very much for transcribing the comic. I really appreciate it. I prefer the character names included, if it’s not too much bother. The purpose of the transcriptions is to make the archive searchable, so if someone searches for “Moses” they will get all the strips he features in, rather than just the ones he’s mentioned in. I like the toothbrush holder Jesus idea… maybe if you push a button on his belly, the toothpaste could be dispensed from his side. The really funny thing is that there would actually be a market for it among the faithful..
A searchable index – nice work TRiG. That will be a very Handy Guide – hope it goes without any hitches. Actually, in the beta model that’s now in the works, the toothpaste flows from his wrists and ankles. This new taste sensation is called “Stigmata”, and it will make the water you rinse your mouth with afterwards taste just like wine. sittin’ on the top shelf of my sink. guess I’ll just go out and have beeeeeer. Toothbrush holders are kidstuff! How about a lightswitch cover with the hole for the switch to poke through in Jesus’ crotch? For the ResErection Light Switch Cover go to evolvefish.com, select ‘Miscancellous products’, choose the second page and scroll down. I tried transcribing the comic because there was a link at the top of the page saying “Transcribe this comic”. It’s gone now. But if I see it again I’ll try it again. Author?? You still there..? Are you alright? Or have you caught the bug that did for me? Yes, still here and alright, thanks. Sorry for not posting. Family circumstances. 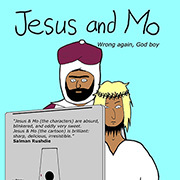 So, on perhaps my sixth re-reading, it finally occurs to me that the only difference between mocking Islam and Christianity as far as Moses is concerned, is the threat of violent retribution. His principled arguments notwithstanding. Wonder what kind of figurine they’d construct to mock atheists. One made of straw and searching for a soul? Humour worth careful thought is the best. Mocking atheists is easy. Just remind us that we allow this crap to go around unchallenged because we think it impolite to assault people’s deeply help sincere beliefs. Like that should matter. How do you create art mocking evidence based reason? Perhaps Darwin’s head on an apes body, with the pencil hole in the rear? Doesn’t seem to resonate, but I expect it would sell big time in the religious Right community. Cartoonist, your work is great! But no new cartoons in a while. What is up? are you OK? Hey author, like Sailor, I get a little nervous when we don’t hear from you for a while. Taking a rest, or did you have to leave in a hurry? I’m waiting for the crucifix toilet scrubber.